It's Sunday morning and my brain is jelly. In a week I'll be completely unplugged and unreachable in my idea of paradise and I am dying to get out of here. My great pals at My Out Islands recently produced a video about my beloved Cat Island and watching it isn't helping me concentrate on what I need to get done this week. They did a fantastic job and it really captures the off-the-beaten path spirit of the place. Cat Island and the rest of the Out Islands are everything The Atlantis Resort is not. The Ministry of Tourism refers to the Out Islands as the real Bahamas and I can't agree more. Life's hard out there and as a visitor, the payment for the hardships endured is a nearly hallucinatory quiet. That video's interesting too in that I know everybody who's in it. Tony Armbrister owns the house where I stay and Captain Tom lives next door. I love it too that they show some scenes of Cat Island's glamorous and exciting night life. Well it's glamorous and exciting if your idea of a good time is a guitar and a bonfire on the beach. The video doesn't explain the story of Father Jerome and the Hermitage very well though. 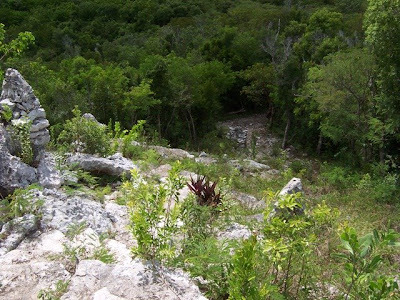 The Hermitage is the name of the ruin on the summit of Mount Alvernia (elevation 206 feet!) the hostess is walking around toward the end of that video. 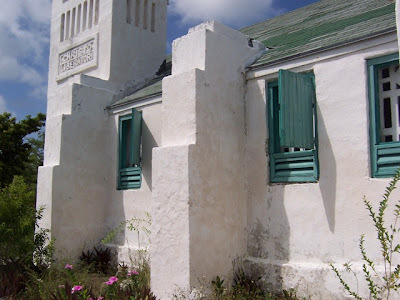 The Out Islands of The Bahamas maintain their history orally and what follows is the story of The Hermitage as it's been told to me. 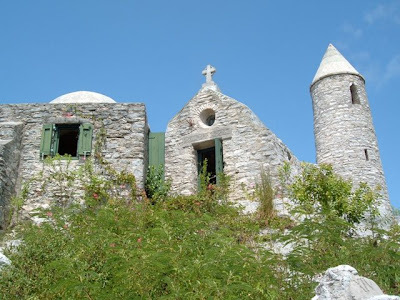 I have scoured the Internet looking for more information on the man embodied in those stone structures, but alas, I think the story of Father Jerome and his Hermitage exists only in the late night stories of the people of Cat Island. The Hermitage was built by a man from Ireland once named John Cyril Hawes but known later as Father Jerome. 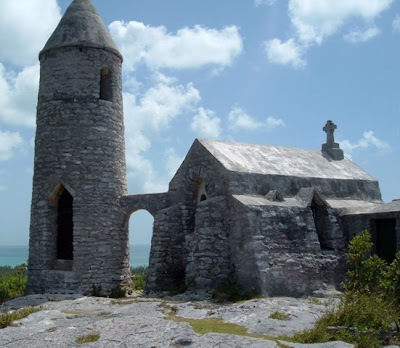 John Cyril Hawes was an architect and Anglican Priest who came to The Bahamas in 1909 by way of Australia to build churches for the Church of England. In Clarence Town on Long Island, he oversaw the construction of what became his final Anglican church, the Church of St. Paul. Something happened to Hawes during that construction project and exactly what happened is lost to history. What is known is that as soon as his Anglican church was completed, Father Hawes converted to Roman Catholicism and began to study for the Roman Catholic priesthood. He entered the seminary as Father John Cyril Hawes and he left as Father Jerome. Once ordained, he sailed back to Long Island and broke ground on a Catholic Church in Clarence Town. Father Jerome's Church of St. Peter was completed in 1939 and still stands in sight of John Cyril Hawes' Church of St. Paul. Father Jerome then sailed onto Cat Island. He set about immediately to build the still-standing Church of the Holy Redeemer in Freetown. Shortly after its completion he started construction on his Hermitage, which is where he would live out the last of his days in seclusion. Father Jerome died at the age of 80 in 1956. The Hermitage, as it's come to be known, is a monastery in miniature. Father Jerome built it by himself with stones he carried, one by one, to the summit of Mount Alvernia. To climb up the stairs he cut into the hillside, to follow the Stations of the Cross he carved into his nearly vertical walking path, to stretch out on the stone cot where he slept is to look deep into the character of a man. It's not possible to walk away unaffected. Because the Hermitage is located so far from anything, some of his personal effects are still up there. The Tabernacle he carved and painted sits just where he left it on a small altar. His inscriptions, in Latin and Italian, are as legible today as they were when he carved them. Cat Island seems to have cast the same spell on Father Jerome as it has on me. 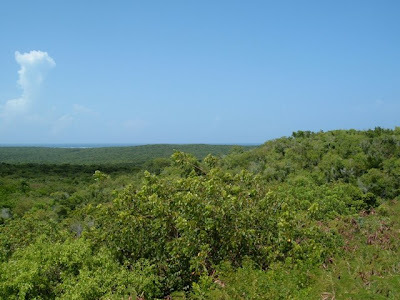 Every time I go back, I can't shake the idea that I should somehow just drop everything and go hide out on an island hillside somewhere in the Atlantic. But then I look around at everything Father Jerome built and realize that I just don't have it in me. I'm not made of the same stuff. So I go back again and again and I listen to the stories and I marvel at the land and I sit and I watch and I just let it be. OK, who's ready for some of my vacation photos?! This is looking down the footpath Father Jerome used to carry up the stone from which he built his Hermitage. I am looking up at the back of the Hermitage from about three-quarters of the way up Father Jerome's path. 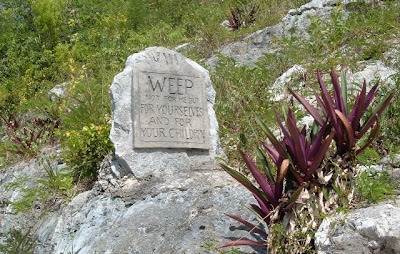 The last step on the path features a final word before entering The Hermitage proper, "Weep not for me but for yourselves and your children." The Hermitage. The bell tower still has Father Jerome's bronze bell in it and the tower's attached to his one-room, one-pew church. This is me standing at the rear of The Hermitage. Father Jerome's church is connected to his living quarters and food storage rooms. This is one of Father Jerome's majolica plaques that's been mortared into the wall of his church. 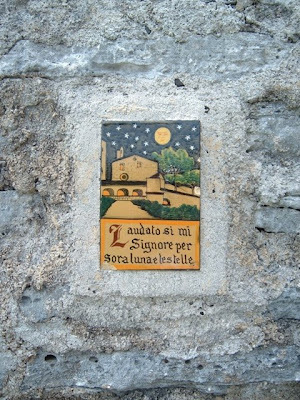 In Italian, it reads "Praised be to you Lord through the moon and stars." When Father Jerome knelt to pray in his church he faced a window and here's what he saw. 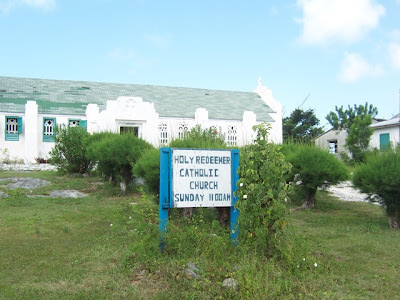 This is the Holy Redeemer Catholic Church in Freetown, Cat Island. It was the last church built by Father Jerome. Father Jerome's work shows a really strong Moorish influence and it's unmistakable in this detail shot of the Holy Redeemer Church. The Narthex of the Holy Redeemer Church is decorated in primitive frescoes. 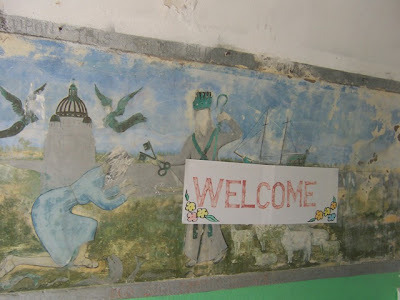 The frescoes were painted by Bahamian villagers under Father Jerome's supervision. They are fading now and I think it's a riot that someone taped up a home made welcome sign. Lovely. Lovely story. Lovey pictures. Lovely heart in the words. I'm sold. 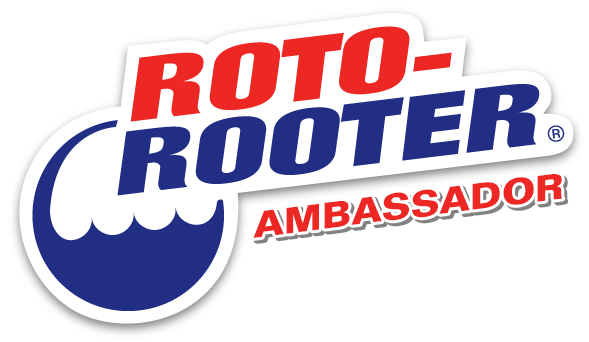 We have never been to the Bahamas, but this definitely just got added to our travel list. The place has your name written all over it Melody. That it's within such a short distance to the east cost of the US makes it all the more remarkable. And primitive's definitely the operative term. Thanks Brenda! OK I'm sold...but how do you get there? (I live in South Florida so I have location on my side!) 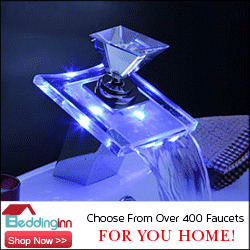 Love love love your site! 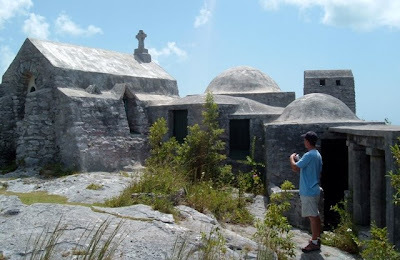 them are shot at the hermitage or on Cat Island. Bex: Thanks! Cat Island's an easy jump for us in Florida. 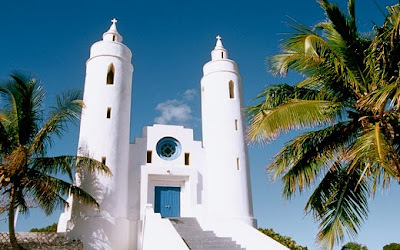 You can fly there via Nassau on Bahamasair or Cat Island Air. Christian: Please feel free to contact me directly. I'd love to talk to you about Cat! Thanks for the clarification Anonymous, I'll make the correction. Do you live on Long Island?